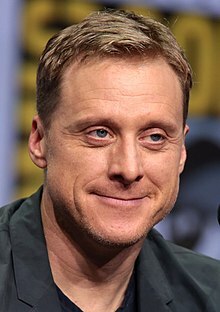 آلن تودیک (اینگیلیسجه: Alan Tudyk) آمریکالی دوبلور و اوْیونچو. ۱۶ مارس ۱۹۷۱ ‏ ایلینده آمریکادا دۆنیایا گؤز آچیب. 1997 - گۆنوموز ایللر آراسیندا سینما ساحه‌سینده چالیشیب. ↑ Genzlinger, Neil (December 15, 2011). Shipwrecked, and Landing New Personalities. ↑ Alexander, Bryan (October 25, 2015). J.K. Simmons, Tommy Chong get run of 'Zootopia'. USA Today. ↑ Rome, Emily (July 22, 2016). Alan Tudyk revealed his 'Moana' character and gave us a sample of his voice performance. HitFix. ↑ Melrose, Kevin (October 25, 2018). 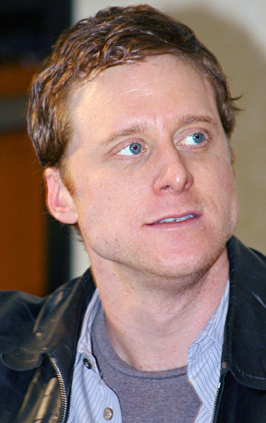 Alan Tudyk to Voice The Joker in Harley Quinn Animated Series. Comic Book Resources. ↑ Chalk, Andy (February 18, 2016). Master of Orion trailer reveals a cast of sci-fi stars. PC Gamer. ↑ Gans, Andrew (October 6, 2009). An Evening Without Monty Python Plays NYC, Beginning Oct. 6. Playbill. ↑ Brantley, Ben (October 8, 2009). "And Now for Something Just a Little Bit Different". The New York Times. Retrieved January 11, 2019. اینگیلیسجه ویکی‌پدیاسی‌نین ایشلدنلری طرفیندن یارانمیش«Alan Tudyk»، مقاله‌سیندن گؤتورولوبدور. ( ۲۲ ژانویه ۲۰۱۸ تاریخینده یوْخلانیلیبدیر). قارداش پروژه‌لرده آلن تودیک گؤره داها آرتیق بیلگی‌لر تاپابیلرسینیز.